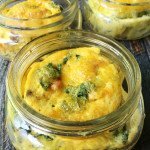 This omelette in a jar recipe is perfect for a high protein and low carb breakfast on the go. Make ahead and eat all week. In a skillet,add the olive oil and sauté your peppers and mushrooms. Add your spinach and turn off the heat. Mix the spinach around until it's wilted. In a bowl, whisk your eggs and yogurt. When they are mixed well, add half of the cheese. Fold in the pepper mixture until well combined. Spray the inside of the jars with cooking spray and then add the egg mixture. Make sure to leave 1/2 inch to 1 inch from the top because they will rise and you don't want it to spill over. Top each of the jars with the remaining cheese. Place jars on a cookie sheet and bake for 15-20 minutes or unitl the top is firm. Let cool and then add your lid and store in the refrigerator or eat. Note: These are 1/2 pint jars. If you use larger jars you will have to use more filling and it may take longer.